Iranian brands for drinks/ food as well as packaging companies are keen to upgrade and innovate post sanctions. Iran’s huge consumer market opens to innovative PET packaging applications and technologies. 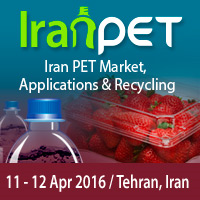 Iran’s huge consumer market opens to innovative PET packaging applications and technologies. Leading global corporations sharing relevant technology include – Gneuss, Sacmi and EPC Engineering Consulting on ‘Pushing the Limits of Extrusion – Customized Melt Properties with MRS Technology’, ‘Latest Development on Injection Preform Systems’ and ‘Polymer revamps and PETG from CHDM’ respectively. Bericap – How Closure Innovation allows Lightweight Packaging? Major PET resin producer Shahid Tondgooyan Petrochem’s Saeed Emami, R&D Manager gives analysis of ‘Iran’s PTA, PET & Polyester Industry Outlook’. Whilst Mohammad Sadegh Rahimian, CEO of Red Tree Trading focuses on ‘Iran’s PET Position in the Regional and Global Trade Flows’. Hamid Reza Sadeghi, Quality Assurance Manager at Khoshform Toos reveals the ‘Challenges & Opportunities in Iran’s Preform Market’ while Farzad Khozemieh, Assurance Manager at Polyacryl Iran Corp. looks at the ‘Opportunities in Iran’s Polyester Sector’. Organized by Centre for Management Technology (CMT), the IRANPET Summit is co-sponsored by Piovan, Sacmi, NGR, Gnuess, Frigel, Sidel and EPC Group (also an exhibitor). View event website for more details or call Ms. Hafizah at +65 6346 9218.